Beers and brainstorms? Vino and Van Gough? Creating music while under the influence? Do drugs and alcohol really make you more creative? I used to think drinking wine made me a better writer and more open to new ideas. Sometimes I would set myself at the computer and start to write an article or a blog post or a strategic plan, thinking I was tapping into the most creative outlets of my brain after a few glasses of wine. But, more times than not, I’d wake the the next day with a foggy brain and be utterly disappointed in my work. I’d usually have to scrap it or edit heavily because of careless errors. 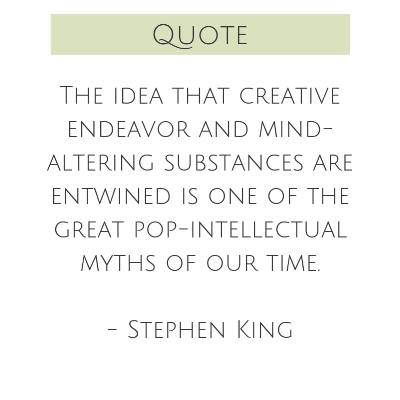 When it comes to falsehoods or myths out there I’d like to shatter, it' definitely surrounds the thinking that drugs and alcohol promote creativity. That’s a lie! It’s not necessary to become dependent on these substances to tap into your God given creative juices. So I’m going to go out on a limb and say that, most times, when we suffer from creative blocks we aren’t in need of more wine. Rather, we’re in need of inspiration, motivation or just plain rest to get past feeling burned out. This subject is so timely - because all last week I was sick, uninspired and just feeling blah. I LET MYSELF feel that way. I gave myself some rest. I laid on the couch and watched movies with the kids. And I felt grace instead of guilt over giving myself a little room to rest. To tap back into inspiration, I am asking you to complete a Creative Recipe Worksheet - to help bring some of your favorite things to the forefront. In times when I feel stuck, frustrated or in a creative rut, I have found I’m farther away from doing what truly makes me feel content. Complete it and then add some dates to the calendar where you can ensure you are connecting with the things that restore your energy, creativity and passion! Say your Daily Mantra "I experience unlimited creativity with a clear mind."